PCI-Express extender/adapter. All with PCIe x16 straight slot (female connector) and x16, x8, x4 or x1 goldfingers(male connector). 1U 1-slot PCIe x16 riser card, x16 slot(female connector) lined with board slot6, x16 goldfingers (male connector) to board slot7, slot center height=1.06"
1U PCIe-to-PCI bridge-based active riser card with PCI-32 female and PCIe x1 male connector to the board PCIe slot(for standard 1U chassis). 1-slot PCIe x16 flexible riser card, right-angled female to male connector with various lengths of ribbon cable (3cm,5cm,7cm or 10cm). PCIe 2.0/3.0 Gen2/Gen3 compatible. Adapter riser, mPCIe male to PCIe x1 straight female, w/15cm(6") ribbon or custom length ribbon. fold the ribbon to privide offset and orientation to the left or right. PCI Express X16 flexible riser card with 10cm(4") EMI shielded ribbon cable. PCI e 2.0 Gen2 compatible. Dual PCIE x16 flexible riser card with various lengths of ribbon cable from 5cm to 11cm. right-angled female and male connector can be configured to PCIE x1, x4, x8 or x16. PCIe x1 flexible riser, straight female to male connector, with various lengths of ribbon cable. Re-direct the female connetor to face over or away the board. PCIe 2.0 Gen2 compatible. 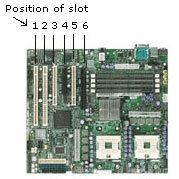 2U 1-slot PCIe x16 riser card. Goldfingers can be configured to x1,x4,x8,x16. Slot center height=2.61". PCIE 2.0/3.0 Gen3 compatible.